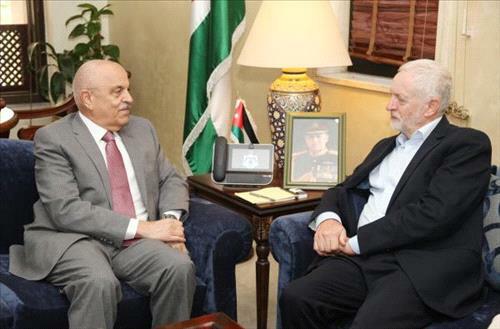 AMMONNEWS - Deputy Prime Minister and Minister of State, Rajai Muasher, on Saturday met with leader of the British Labour Party, Jeremy Corbyn, who is currently visiting Jordan. Both officials discussed challenges facing Jordan due to the unstable regional situation and the latest developments in Middle East. The leader of the British Labour Party underlined his party's firm positions on the Middle East issues, foremost of which is supporting a just settlement of the Palestinian issue and supporting a political solution to the Syrian crisis. He also emphasized the right of the Palestinian people to live in peace on their own land in an independent and recognized Palestinian State, noting that the future of Jerusalem must reflect peace between all. He said the construction of Israeli settlements that hinder efforts to achieve peace must be stopped. During his stay in the Kingdom, Corbyn said he would visit Syrian and Palestinian refugee camps as part of the British Labour Party's interest in improving their living conditions. Corbyn lauded Jordan's efforts in hosting refugees and said he understands the heavy burden of hosting large numbers of refugees. He called on the international community to assume its responsibility in supporting Jordan to continue providing humanitarian and basic services to refugees. Muasher said Jordan has faced unprecedented challenges over the past seven years as a result of the Syrian crisis and the influx of refugees, which had put great pressure on the infrastructure, such as schools, hospitals and water sources in addition to the labour market. He added that the assistance and support Jordan has received from the international community is less than what was pledged and was re not enough to cover the cost of hosting refugees, which exacerbated economic challenges and the budget deficit. Muasher spoke about a number of local issues, including the draft income tax bill and political social and economic reforms. He also reviewed some regional issues, among which was the Palestinian issue and the importance of the European Union's role in advancing peace talks and find a just solution to it.